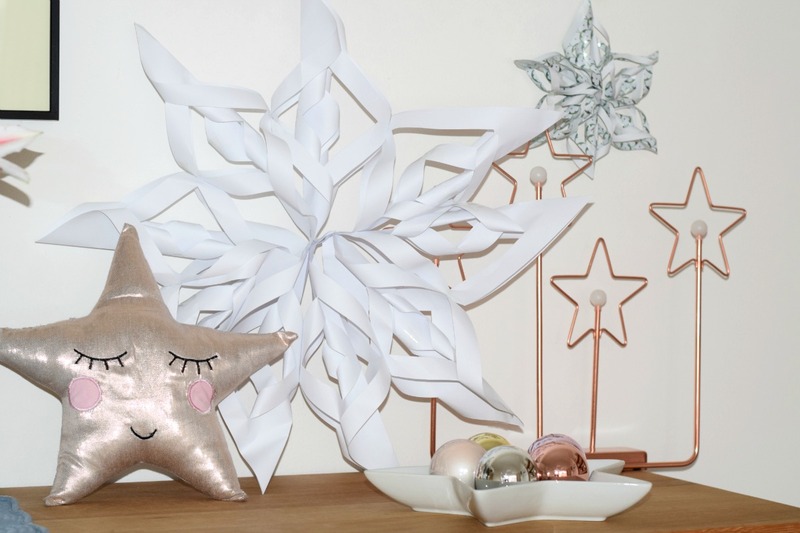 I’m all for a craft idea that is quick and easy to do, even more so one that doesn’t involve sewing and can actually be used afterwards. My eldest, Sam, is a born crafter. He loves making things and quite often gets an idea in his head and works on it until it’s finished. Or very nearly finished, depending on how long his attention span is that day! He really does have that the creative gene though and is never happier than when he’s surrounded by paper, scissors, a stapler, pens, and now… tape! 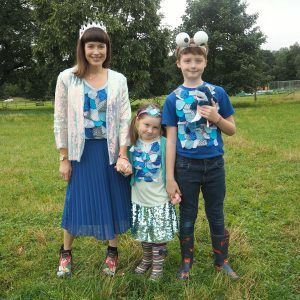 We spent a few hours at the weekend working out what we could make with these three rolls of coloured duck tape, and this is what we came up with. 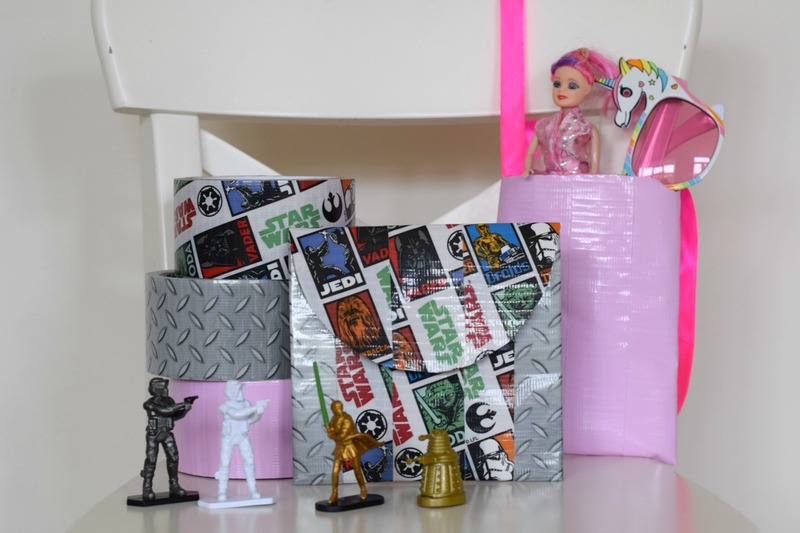 A Star Wars wallet and a necklace dolly purse, which can also double up as a sunglasses case, Mini Milk holder or handbag, depending on Flo’s mood. We were sent these rolls of Duck tape a few weeks ago to see what we could make with them, and they’ve been languishing in the corner of the kitchen until we came up with the perfect plan. A bit of browsing on Pinterest showed there are actually loads of things you can make with this kind of tape – aside from the use my friend suggested, which involved serious crime, and an idea thrown into the ring by Pinterest, which let’s just say combined Kim Kardashian and a very low-cut dress. Pinterest is a place which seems to have captured Sam’s imagination more than mine; he loves having a browse and pinning images and craft ideas onto various boards. 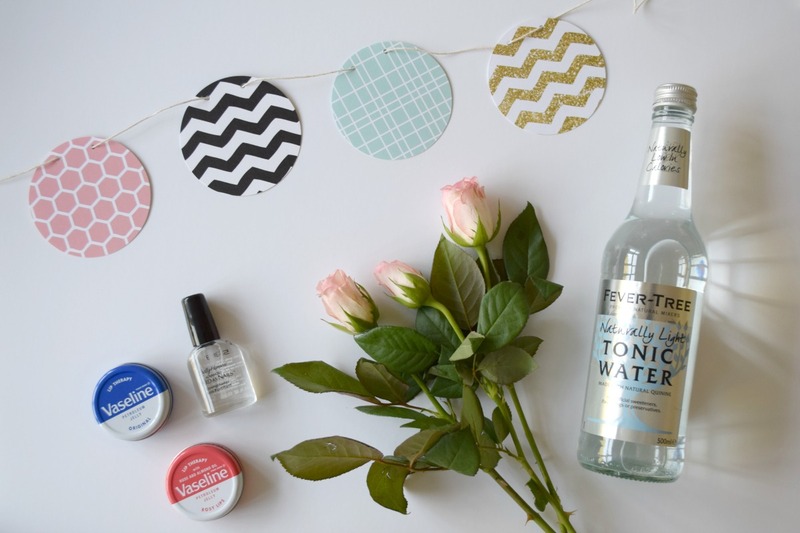 We decided to try these two out as a starter, so here’s how if you fancy having a go yourself. 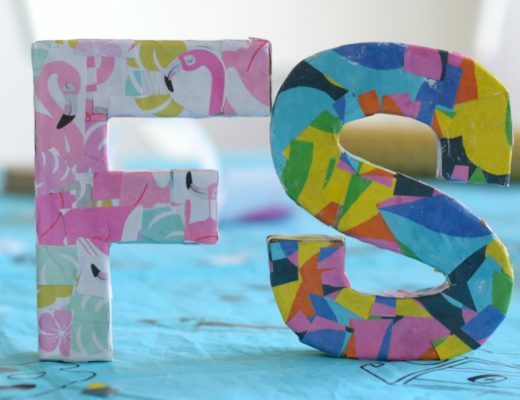 For this you will need a piece of fabric and a ribbon. 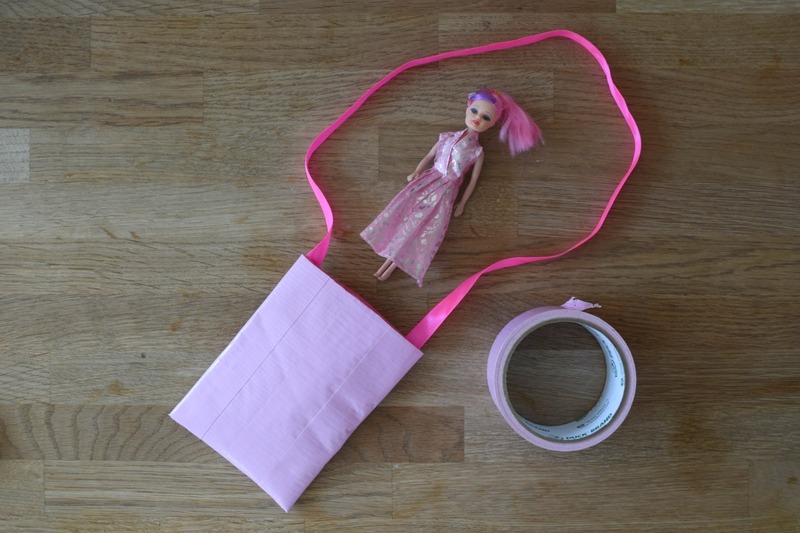 You start by cutting the fabric to the size of the purse you want. We did this by measuring it around the doll we wanted to live in it. Next, cover the middle with two strips of tape, before trimming it off at the ends. 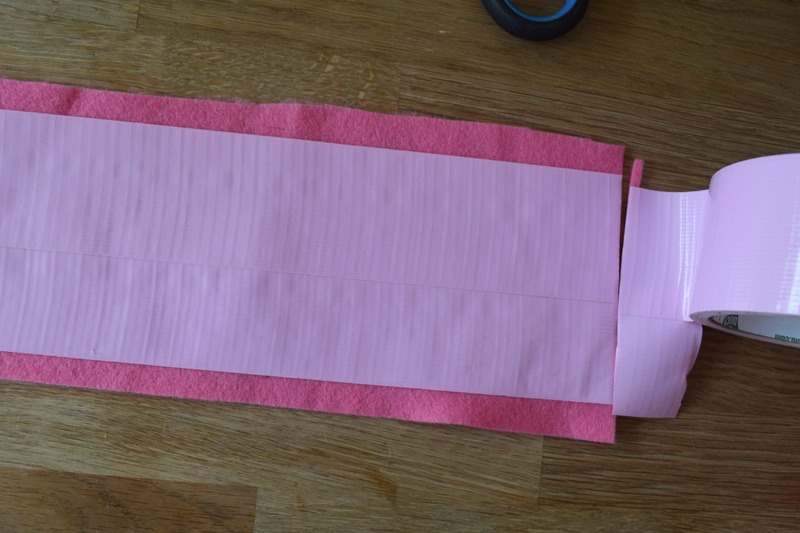 Then fold it over so the tape is on the outside and close up the sides by folding another piece of tape around each edge, so it makes a bag. You can use the same colour of a contrasting tape if you like, and you’ll need to carefully trim it at the top and bottom afterwards. To finish it off, just fix a piece of ribbon to the inside edge. We tried to glue it but it wasn’t strong enough, so ended up using a stapler. That’s it! One dolly bag, ready for use! 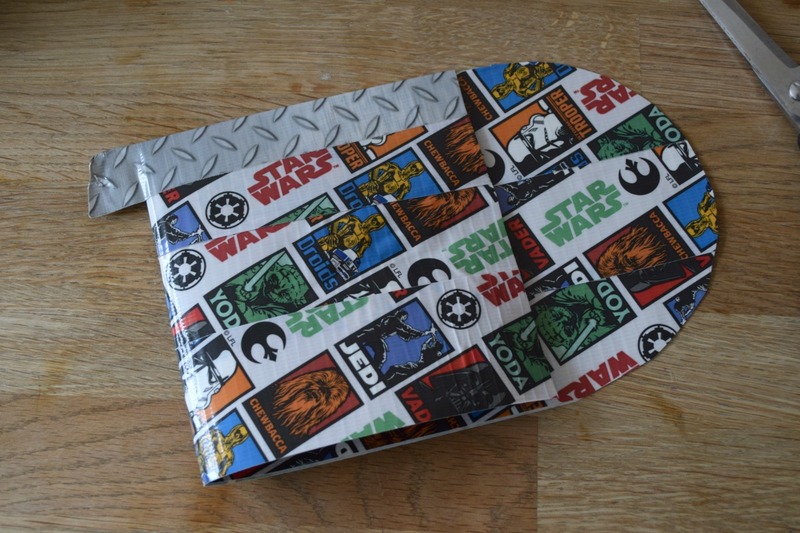 We used the Star Wars duck tape for this but you could use any design or colour, depending on what you have. 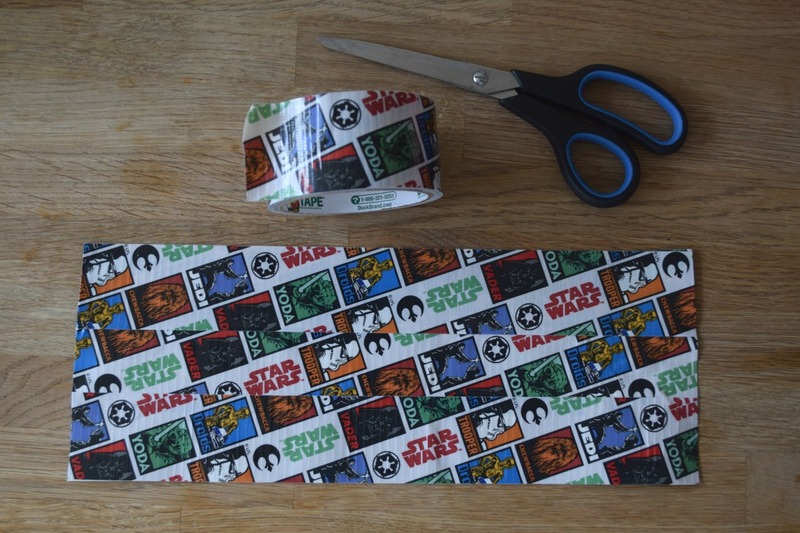 You start by making a sheet of tape. 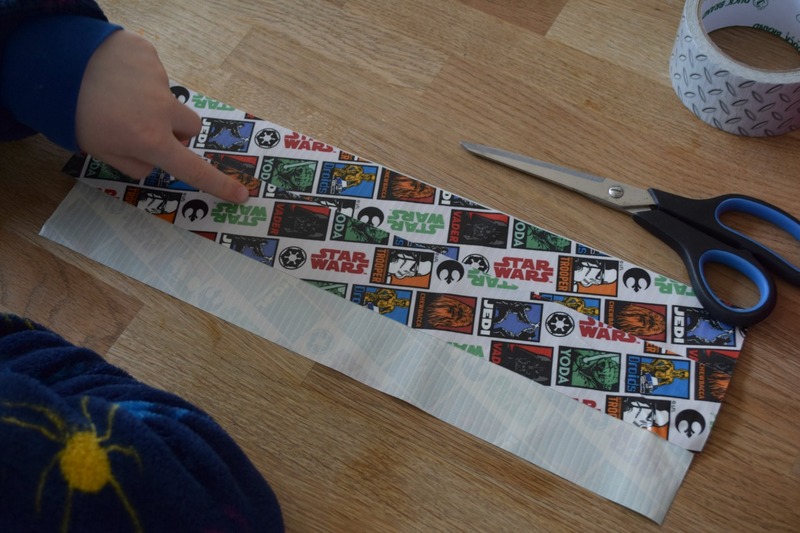 To do this, cut a piece of tape about 30cm long and lay it on a table sticky-side up. Then put another piece next to it, again sticky-side up and slightly overlapping. Do this again until you have a row of three tapes. Next cover up the sticky side with three more lengths of tape, so you have a sheet with the shiny tape on the outside. You might need to straighten up each side by trimming it neatly. Now you’ll need to cut a curved edge onto one side. I used a small bowl to measure a semi-cirle on one end and cut it out. 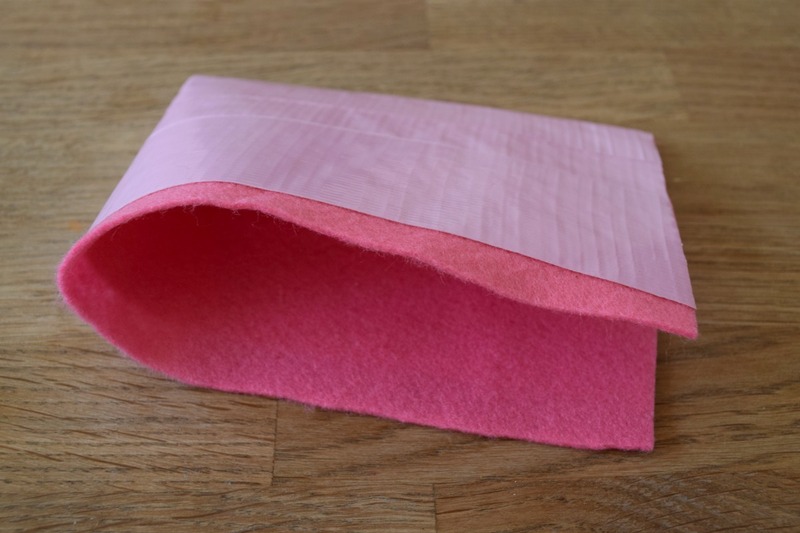 Now fold the sheet over so you have a wallet shape with a curved flap. Just close up each side with a piece of tape, and you have your wallet. We used a small piece of folded-up tape to stick the flap down, but a better solution would be to buy some small self-adhesive velcro dots to make your wallet easy to open and close. Et voila! 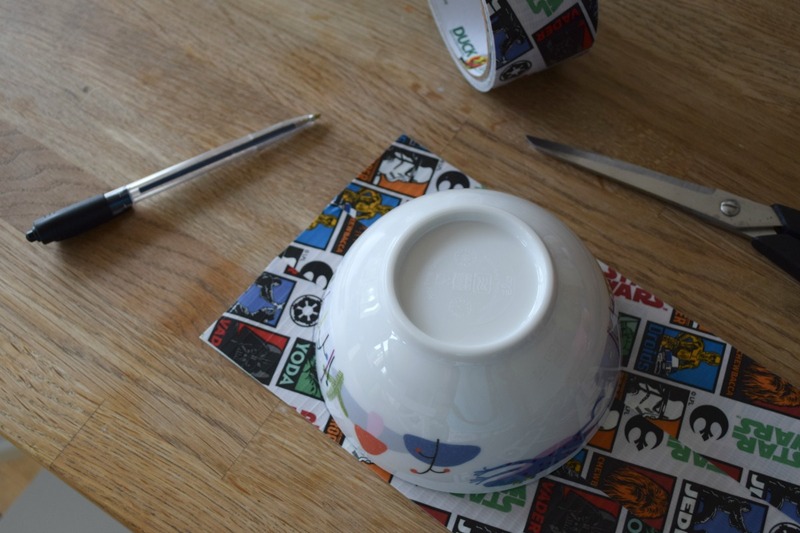 A neat little wallet or purse for all your child’s (or your) bits and bobs. oh what great ideas! 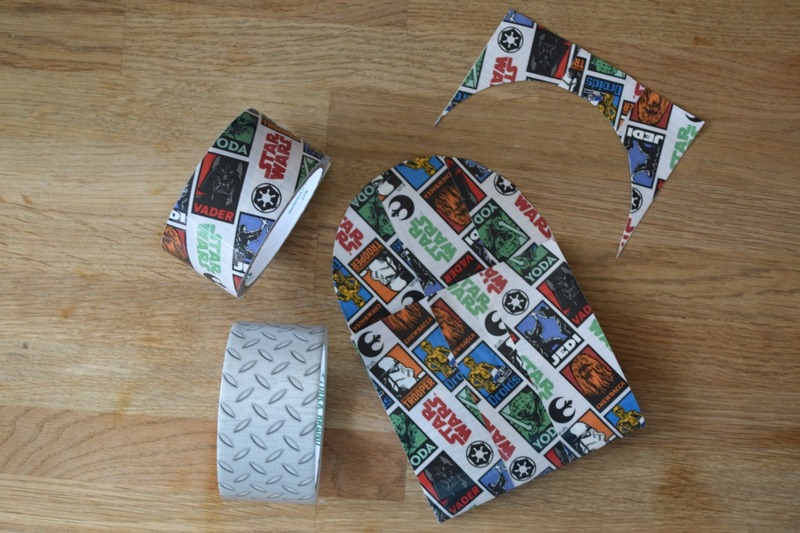 I’ve seen some lovely tapes in Hobby Craft in all sorts of designs and I’ve often wondered what I would do with them if I bought them. I guess you have to think out of the box because I’ve always used tape for sticking things together and never even thought of other things. I’ll be off to Pinterest now, I’ve not checked in for a while and I usually only look for cakes! Anne recently posted…My Blog Manifesto! 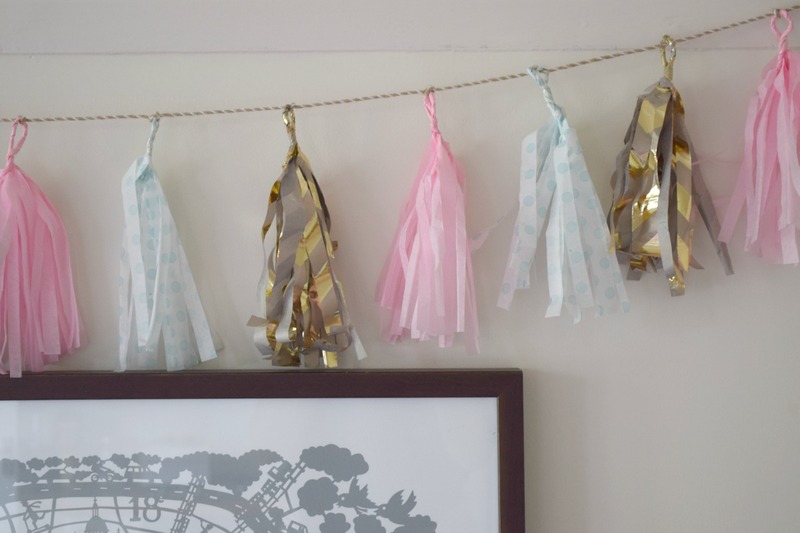 What brilliant and quick little crafts! 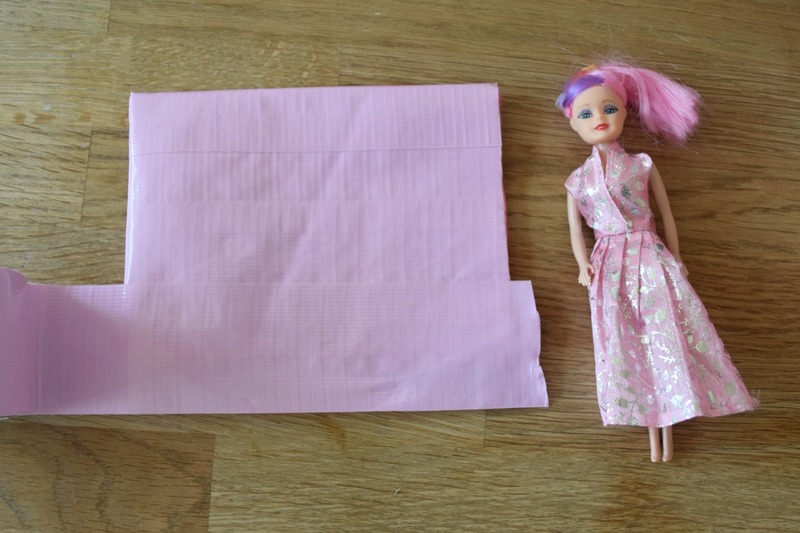 I do love a roll of special tape….maybe I need to get some so Miss M can make a little bag for my old Pippa doll! #HomeEtc. Ah, very clever. I like it. My husband made scabbards out of silver duct tape to house the wooden swords he built for the boys. They must be about three years old now and they are still going stong.